You can see above the famous Youtuber Marques Brownlee (MKBHD) confirms that it works. Both the Nexus 6P and 5X come with USB Type-C ports and USB Type-C cables for charging. 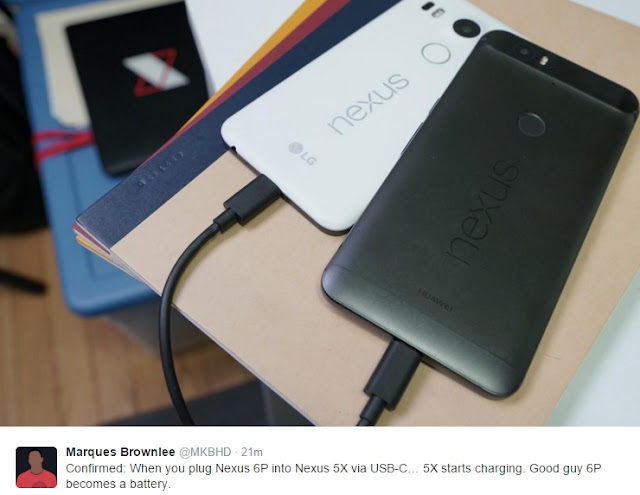 Interestingly, it's been discovered that, if you connect the Nexus 6P to the Nexus 5X via a USB Type-C cable, the former starts charging the latter. Thus, the large 6P (which has a 3450 mAh non-removable battery) can act as a power bank for the smaller 5X (which comes with a 2700 mAh battery, also non-removable).